About Accepting Those 65,000 Syrian Refugees . . . . Details are still sketchy in the aftermath of the horrific Paris terrorist attacks, but it appears that at least one of the killers was part of the wave of Syrian refugees that has come to Europe in recent months. The French Prime Minister says he believes the attacks were planned from Syria, and intelligence agencies are fearful that ISIS, the organization that is claiming credit for the Paris atrocities, has implanted terrorists among the flood of refugees. At Saturday night’s Democratic candidate debate, Hillary Clinton restated her view that the United States should accept 65,000 refugees, far more than the 10,000 President Obama originally proposed. 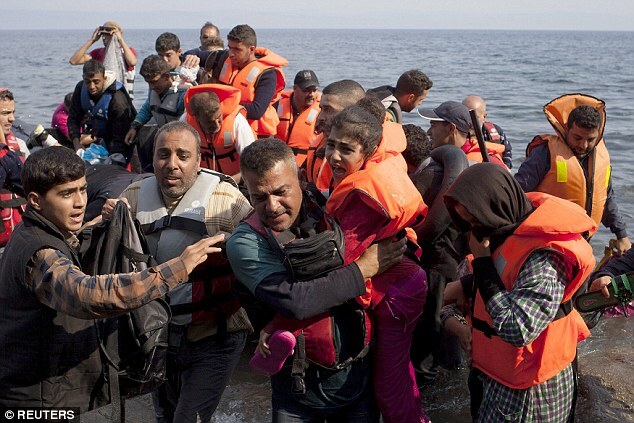 Obama Administration officials have discussed accelerating the process of vetting refugees for admission to the U.S. and defended the idea of accepting Syrian refugees, arguing that the refugees have suffered through the horrors of war and that “we can’t just shut our doors to those people.” Republicans, on the other hand, contend that the security risks of accepting the refugees is simply too great. This is one of those issues where the heart and the head tug in different directions. The heart takes seriously the Statue of Liberty’s pledge to welcome the huddled masses yearning to breathe free and wants to help the downtrodden whose lives have been destroyed by terrorism and war. The head, on the other hand, recognizes that allowing thousands of refugees to come to America inevitably increases the risk that terrorists might be among their midst, ready to pursue Paris-like atrocities on American soil. The key point, for me at least, is whether the United States really can perform effective screening of refugees. In Europe, where hundreds of thousands of refugees have been accepted, the vetting procedures have been slapdash at best. The Obama Administration and Mrs. Clinton say the United States can perform a more thorough and careful investigation before allowing refugees into the country — but I’m skeptical of that claim. Background screening presupposes the possession of accurate background information. When employers check the job history or criminal record of applicants, they use public records and established data sources. Do we actually have access to similarly reliable information about purported refugees from a war-torn land that has never been a friend to the United States? Are we going to accept a Syrian passport at face value? Even if we could determine whether an individual is in fact a Syrian national, how do we confirm that they haven’t been radicalized by ISIS? All of these seem to be insurmountable problems with any meaningful screening process — and if you are accepting tens of thousands of refugees, only a small fraction of screening failures could produce catastrophic results. The deadly Paris attacks raise legitimate questions about the security risks presented by accepting Syrian refugees, and if we don’t at least consider those questions in establishing our own policy and procedures we have only ourselves to blame. It is not xenophobia to require some assurance that we can make meaningful screening decisions about whether a particular person who claims refugee status is, or is not, an ISIS terrorist-in-waiting. Until such assurance can be provided, the better policy may be to honor our humanitarian impulses by working to establish safe havens for refugees within Syria itself. This entry was posted in America, Politics, World and tagged America, Hillary Clinton, ISIS, National Security, Paris terrorist attack, Politics, President Obama, Syria, Syrian Refugees, terrorism, World, Xenophobia by webnerbob. Bookmark the permalink. These actions of the highest treason, our leaders have totally abandoned us. Good compromise, WB. My heart says swing the doors wide and let them in. My mind says head for the hills and hide from everyone because you just never know what unbelievable thing will occur next.